They were one of the hottest couples in world sport. Sure there were other hot couples who generated more publicity. First we had cricketing hero Michael Clarke and Lara ‘Where the bloody hell are you?’ Bingle. Then Greg Norman fell head over the tennis net for Chris Evert before both former world No 1s from their respective sports got married. But when Adam Scott began dating Serbian tennis stunner Ana Ivanovic it looked to be a match-up to make all males green with envy. But like Clarke and Bingle, and Norman and Evert, Scott and the also former world no. 1 tennis ace are longer an item having split and gone their separate ways earlier this year. The duo looked the ideal match-up. Scott was spotted in the stands at Wimbledon lending support while Ivanovic would attend the odd golf tournament, including last year’s Barclays Scottish Open, to do the same for the Queensland-born pro. Scott spoke of the break-up in his 18-month relationship with the Belgrade-born beauty, who turned 23 last month, ahead of his defence of the Australian Open title. 2008 French Open and just months after she was runner-up in the Australian Open. She’s won eight other WTA titles and five ITF titles but at the end of October had slipped to No. 24 in the world while Scott had dropped from a high of no 3 in July, 2008 to 42nd at the same time. 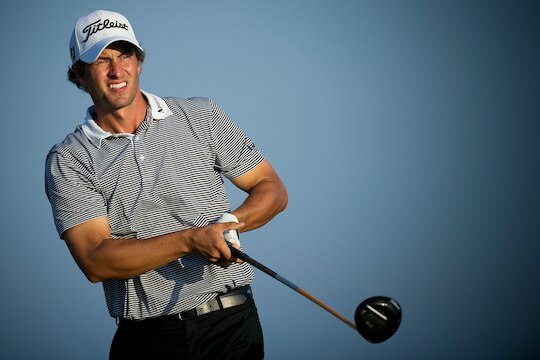 In his eight-year pro golfing career, Scott has captured 16 other victories but is yet to win a Major. “It was disappointing that Ana and I are longer together, and it was tough when her and I broke-up,” said Scott. “It wasn’t always easy seeing we both had our respective sporting careers. “But in the time we had together we had a great time and I really enjoyed her company. “Ana is an amazing person and an amazing tennis player, too. Despite going their separate ways, Scott revealed the duo still keep in contact with each other. “We still keep in touch and I guess she’s wondering how I am getting on with my golf, just as I still take an interest in how she is performing,” said Scott. “But I guess the timing wasn’t right,” said Scott. “It’s just one of those challenges that every relationship is faced with. Ivanovic isn’t the only leading light to lose Scott’s “affections” this year. He and fellow Australian Robert Allenby have forfeited their European Tour membership, claiming changes to that Tour’s eligibility clauses have forced them to decline taking up 2011 Tour membership. The European Tour recently approved an increase from 12 to 13 the number of tournaments members have to compete in a season to retain automatic membership. And they’ve decreed that three of those 13 events have to be played in Europe proper. Scott first joined the European Tour in 2002 and secured his card by contesting just six tournaments. The Queenslander remained a full Tour member until moving to the United States in 2006. However he again took up European Tour membership two years later playing a schedule that combined both the US Tour and also competing in the then mandatory 11 events. 12, which took effect from the start of 2009. Scott managed 13 European Tour events last year but this year, and up to and including the Barclays Singapore Open, he had played in 10 with only two of those, the French Open and the British Open, in Europe proper. In fact, Scott’s name was removed from the Race to Dubai money list race. “It’s not necessarily too difficult to play 13 but it is becoming increasingly difficult to be competitive if you are playing both Tours,” Scott told The Golfer Pacific. “You end up forfeiting six or seven starts to each Tour and how do you compete over a season when you have six or seven other players taking up those spots? “I want to continue being a world player but then I also feel I want to be rewarded for good play. “And when you are giving up six or seven starts you can play alright but finish way down the rung on both Tours. “By playing both Tours you just don’t get a good assessment of how you performed. “That’s why it’s becoming increasingly difficult to be competitive on both the US Tour and the European Tour. “I’ve also been playing both Tours for a long time now and running all over the place so much. Allenby also saw his name removed from the European money list after having played seven events up to and including the WGV – HSBC Champions in Shanghai. The Victorian first played on the European Tour full time in 1992 but in 1999 moved to the States. But with the launch of the Race to Dubai in 2009, Allenby paid a £2,000 membership fee and rejoined the Tour to play in 14 events and made the halfway cut in all but one to finish 21st on the money list. However a knee injury mid-season saw Allenby miss the all-important WGC – Bridgestone Invitational and the following week’s US PGA Championship. Still the decision to increase the number of events to 13 certainly hasn’t pleased Allenby. “It makes it even more difficult and particularly as I struggled this year to play the mandatory 12,” he said. “Really, you only need to find 11 and your 12th event can be Dubai as long as you are inside the top-60 to qualify. “But now with the decision that three of the 13 have to be played in Europe it makes things even harder. “The Tour just seems to want to shut us all out and while the decision may be about protecting sponsors and tournaments, really they are just trying to look after their own. “That’s understandable but then I guess it’s the same in the States because they’re trying to get Tiger and Phil to stay and play. “They can travel all over the world because they receive $US 2m or $US 3m to just turn up. Other Australians who were excited to join the Race to Dubai cash handout but have now been removed as European Tour members included Aaron Baddeley, who played just one money list counting event this year. Geoff Ogilvy played 13 European Tour events last year but only nine this season, and with no intention of playing 12, the former US Open winner’s name was also removed. Rod Pampling rushed to join the ‘Race’ in 2009 and also played 13 but the Queenslander, who earned a two-year European Tour exemption by capturing the co-sanctioned 2008 Australian Masters, has played in no European events in 2010. Other non-Europeans to forgo membership include American Anthony Kim, Columbian Camilo Villegas and the South Africans Tim Clark and Rory Sabbatini.